First to third century AD. Bronze. Needles missing. The fibula was the predecessor of the button. 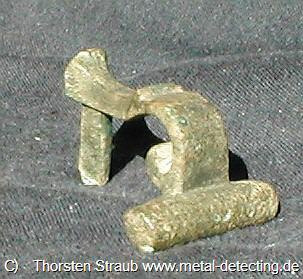 It worked like a safety pin and was used from antiquity to the late middle ages (14. century). Because fibulas changed with fashion it is possible to date them rather precisely. 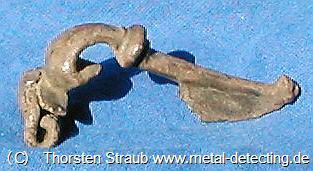 Along with coins fibulas are probably the metal objects which can be dated best. In some cases experts can narrow the time frame down to several decades. 1. to 2. century AD. Bronze. 2. to early 3. century AD. Bronze. This view shows the cylindrical container that once hosted the lost spring. An applique is a small metal object, usually from bronze, that is attached to a pot or vessel and holds the handle. Roman appliques are often nicely embroidered with small scultures. 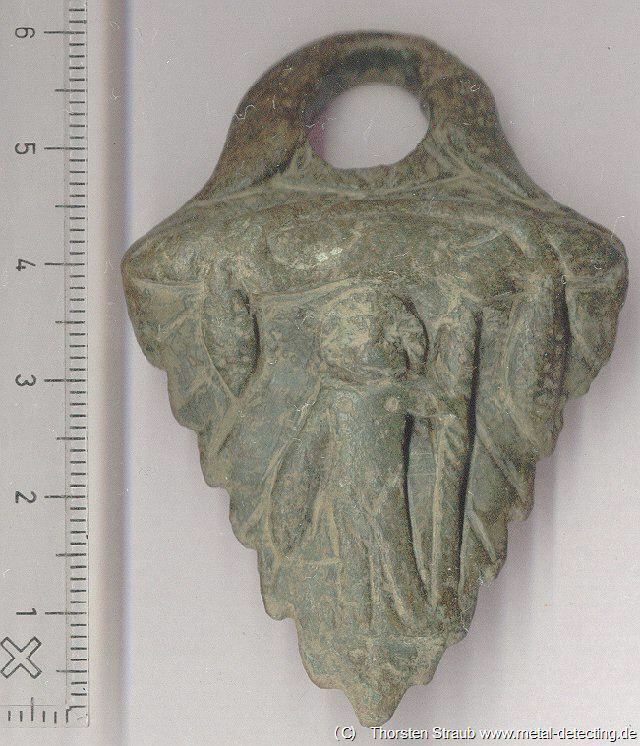 This applique shows a figure holding a pole. The depicted person or god is not positively identified. My personal favourite idea is Bacchus, the Roman wine god. This suits the pole as well as the structures hanging down from above which might be bunches of grapes. Roman applique detail bunch of grapes. This picture shows magnified one of the structures hanging from above. Many small depressions might depict grapes. Backside of the applique. Clearly visible is the groove that once hold the pot’s rim. 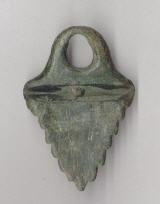 Once the handle, similar to a modern bucket handle, was inserted in the hole. It shows signs of wear. 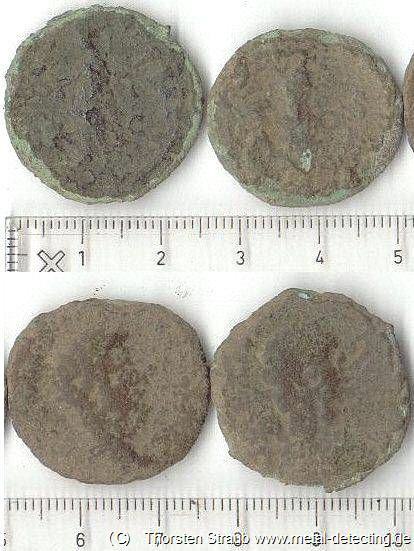 Roman bronze coins are usually in a very bad state of conservation. 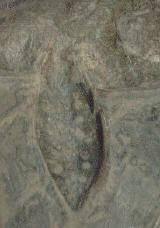 Often corrosion destroyed all surface details. The shown items are in relative good condition. 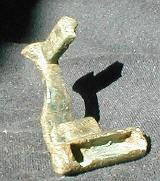 Bronze is much more vulnerable to chemical process in the ground than silver. With some fantasy one can see a head on the averse and a standing figure on the reverse. Roman silver coin Gratian averse. 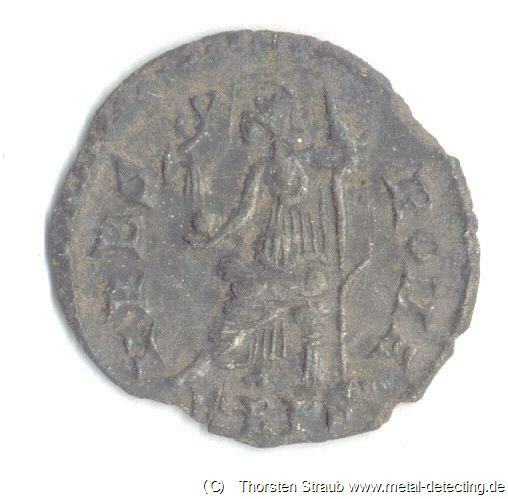 Emperor Gratian was murdered AD 383. This coin shows how much better silver can resist the ages when compared to bronze. 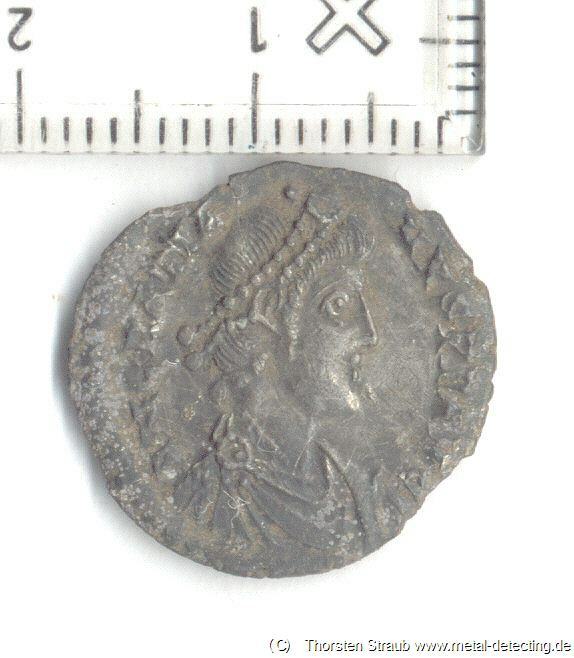 This coin was found near an ancient road and proved it was used in a rather late period. The Roman empire was collapsing in the 4. and 5. century. Rome itself was plundered by the Visigoths and the Vandals in 410 and 465. The last Romans were ordered to leave present day Germany in 488. It was an interesting surprise to see that the road was still used at such a late stage. Special thanks to Steve Gordon from the UK forum for coin identification. For the full find story, see metal detecting a forgotten Roman street station . Gratian was murdered AD 383. 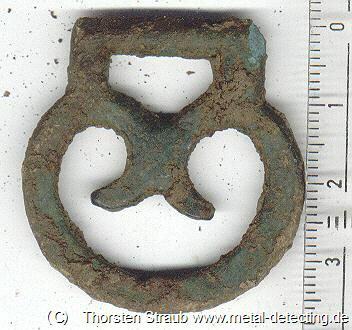 Similar to fibulars buckles change according to fashion and can be dated. This one is Roman. 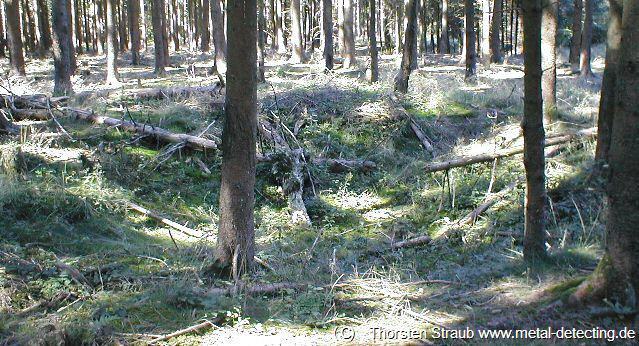 Pits like these are often aligned adjacent to former Roman roads, especially in forests. Many people mistake them for bomb crates from World War 2. The gravel from these pits was used to erect and maintain the road dam. The quality of Roman roads was unsurpassed into the late 19. century.